What to bring is dependent on you. Whatever you bring it is a fact you will forget something and it is also a fact you will carry along something you don't need, that's just the way it is. The trick is to only forget those items that you can get anywhere. Overcoming them is what makes it meaningful. The 2020 Hoka Hey Challenge will be the start of another 10,000 mile test of endurance, patience, and skill. The 2020 Challenge is starting in Panama City Beach, Florida on Sunday August 9th 2020. The Challenge will take you to checkpoints in Arkansas, Vermont, and New Mexico (not necessarily in that order) and bring you back to Panama City Beach, Florida. As with previous years your family and friends can watch your movements using a GPS Tracker provided by US Fleet Tracking. If you are a returning rider you can get you application in starting on February 9th, 2019. Starting August 9th, 2019 the applications will be opened to any and all. There will be only 100 applications accepted for 2020 so do not wait. All applications must in completed by June 9th 2020 - No Exceptions. The "End of the Road" celebration will be held at the Wicked Wheel on August 22nd. The Wicked Wheel is a family owned business. The family that owns it is one of our own; Eric Buskell. The 2020 route is still being developed... I promise you will hate me for it. Be thinking about the charity you want to ride for. The 2018 riders collected over $225,000 for assorted charities. It is our intent to exceed that in 2020. Go to our "Apply" page to enter your application, they are filling fast. Please check back and watch your emails for additional information. 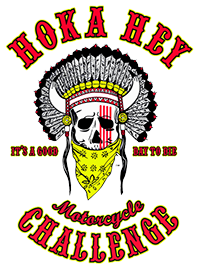 Organized by the Medicine Show LLC, the Hoka Hey Motorcycle Challenge is based on the Lakota Sioux principal of WOLAKOTA and the event celebrates all that is pure and powerful in the warrior spirit. A warrior isn’t just a soldier who protects and defends... They are mentors, guides and teachers. They set the example for others and lend strength to the people. The stronger the warriors become - the stronger the people become. The Medicine Show LLC shares a vision of strong warriors who are ready to lead the way with virtues like RESPECT, HONOR, INTEGRITY and COMPASSION.